It is common for high school science classes to study cells. This video could be used in conjunction to a unit on cells tied to current events and climate related studies. Core mud samples could be analyzed with students and could teach students about the secrets that lie within. 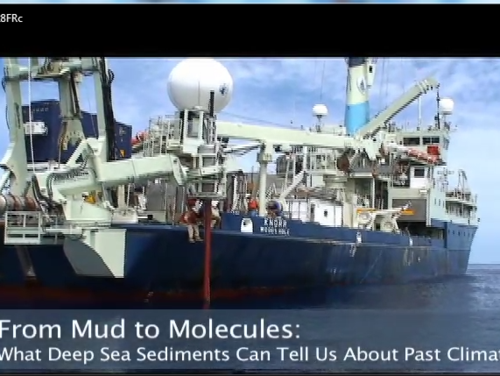 A resource could be used like : http://www.ldeo.columbia.edu/res/fac/CORE_REPOSITORY/RHP1.html where a repository of deep sea sediments is available. The video explains how the marine algae Emiliania huxleyi, aka Emilia, responds chemically to temperature changes making different forms of alkenones at different temperatures. Because ocean temperature is a driver of climate, scientists can use proxy temperature differences as measured by alkenones to understand past climate changes. Comments from expert scientist: The video quickly explains an important proxy (without using that word so viewers will not be confused) used in pale oceanography: alkenone-based temperature reconstructions. It makes a fine job illustrating how the changing ratio of triple to double bonds in the lipids is related to change in temperature at the time of E. huxleyi living. The process of collecting long marine cores is well displayed in the video, as well as how scientists collect small amounts for later research. Prerequisite knowledge required due to strong ties to biological processes and the biological pump and climate changes that are linked to a small marine algae. This video would probably fit quite well in a marine biology or oceanography course where students would have greater access to background knowledge needed to understand the science in the video. Comments from expert scientist: Note that all geochemical methods like this one are based on a couple of assumptions that were not alluded to in the video but are important nonetheless; 1) we assume that the ratio of triple to double bonds covaried in the past with temperature as it does today but nobody was around 120,000 years ago to check that, for instance, and 2) it assumes that very little degradation of the alkenones took place in the sediment (which is not necessarily always the case). These assumptions have been well addressed in the literature. Nonetheless, I always like to address uncertainties and assumptions with my students. If I were to show this video, I would make mention of the two points above.